Writing that Makes My Toes CurlHailey is a star in her own right, and to see her topple from having it all to questioning whether she deserves to be loved, well it broke my heart -- but how often do we get sucked into a downward spiral and can't see past our own misery? Eli is rock awesome. He's been through his own crazy trauma and has determined to forgo women altogether...until cute, tortured Hailey walks by. I knew when I picked up this book I was asking for an emotional roller coaster, but I didn't anticipate how much I would identify with the feelings of guilt and self depreciation. It really got me thinking about how I sometimes carry more weight than is necessary. I repeat, it got me thinking. Above and beyond that, reading Susan's words was like eating literary candy. Sweet imagery, so poetic, luscious prose.I had to stay up until 3 in the morning to make sure these two would resolve their issues, and I enjoyed every moment. A beautiful story, tasty prose, and a plot that leaves you pondering in self reflection? What more could you ask for in a book? After drinking at a party, Hailey gets into an accident that kills her boyfriend, Jeremy, and leaves her alive. Being the driver, she’s riddled with guilt. She switches schools to avoid blaming looks and she also rejects any boy who gets near her.One of the boys she rejects is Eli. He’s sweet and sensitive, but he has something in his past that he’s not too proud of. He falls hard for Hailey, who gives him mixed signals. It doesn’t help that his past pops into the present and that his ex-girlfriend is throwing herself at him.There’s a third person in the picture, Jeremy. At first he doesn’t know he’s dead. He lingers at a graveyard, unsure of why Hailey visits looking so sad and crying heavily. He figures he’s deceased. He haunts Hailey, not wanting to see her with Eli. He even sends her signs that he’s there watching her.Told in these three alternating points of view, this is an interesting story filled with emotion. There are many tearjerking scenes in this book. I grew to like these three young people and their separate issues that converged throughout the story. Haunted is a touching and beautifully written story about loss, love, and figuring out how to live again after a single mistake brings about the unthinkable.Teenage Hailey grows sleepy behind the wheel and crashes her car while driving home from a party with her boyfriend Jeremy. Hailey survives the accident while Jeremy does not. Hailey has to figure out how to go on without the boy she loves and how to forgive herself for the mistake which took his life. Needless to say, neither is easy to do. The story also focuses on Eli, a boy Hailey meets who is struggling with his own demons, and on Jeremy himself, who is trying to figure out how to leave the land of the living behind and enter into the spiritual realm where he now belongs. Oloier has a gift with language and her writing is so lyrical that at times it feels like poetry. This is a book that will stay with you long after you have finished the final page. Hailey fährt mit ihrem Freund Jeremy nach einer Party nach Hause. Auf der nassen Straße kommt sie auf die gegenüberliegende Fahrbahn und es kommt zum Zusammenstoß mit einem LKW.Als Hailey aus dem Krankenhaus entlassen wird ist nichts mehr, wie es war. Jeremy ist tot und sie weiß nicht, wie sie ihren Freunden, seiner Schwester oder Mutter gegenübertreten soll, denn sie ist Schuld am Tod von Jeremy. Sie hatte nicht, wie versprochen nichts getrunken.Um allem aus dem Weg zu gehen wechselt sie die Schule und geht allen Mitschülern aus dem Weg.Jeremy 'erwacht' nach dem Unfall und stellt fest, dass er tot ist. Meist landet er auf dem Friedhof, aber er kann sich nicht von Hailey trennen. Er will sie nicht alleine lassen, versucht sie zu erreichen und hat doch kaum Mittel dazu.Eli hat ein Horror-Schuljahr hinter sich und keiner seiner Mitschüler hat es vergessen. Sicher ist nur: er wird sich nur noch auf seine Musik konzentrieren, Mädchen werde ihm dabei nicht in die Quere kommen. Da taucht die neue Mitschülerin auf und alle seine Vorsätze sind freiwillig über Bord gegangen.Die Dreiecks-Geschichte ist dramatisch und herzergreifend und lässt einen nicht los. Hailey, die sich sich zwischen ihrer Liebe und den verlorenen Träumen und einer neuen Liebe zerreisst, führt einen an den Rand der Tränen. Man weiß, dass sie loslassen muss, aber kann sich nicht dazu überwinden Jeremy endgültig in die Vergangenheit zu bannen. Erst recht, wenn Jeremy auch den Schritt nicht machen kann und auf dem trüben Friedhof auf Hailey wartet oder mit aller Kraft versucht ihr in ihrem Leben zu folgen. Und Eli - er hat so viele Probleme und seine Zukunftswünsche, dass es vielleicht besser ist, wenn Hailey sich nicht für ihn entscheidet. Aber dann mag man es gar nicht lesen, wenn sie ihm schon wieder das Herz bricht.Ich habe viele gute Bücher in den letzten Monaten gelesen, aber dieses Buch hat nicht nur eine spannende, gutgeschriebene Geschichte. Es berührt einen tief und man kann die Gefühle aller beteiligten nachempfinden und kämpft auf jeder Seite mit ihnen.Neulich sagte jemand zu mir: Ich gebe nur 5 Sterne, wenn die Bücher mein Leben verändern. Dieses Buch verändert Leben, weil man über Dinge nachdenkt, denen man lieber aus dem Weg geht. Aber eigentlich denkt man nicht , sondern fühlt von der ersten bis zur letzten Seite alles nach.Wenn es ginge würde ich hier 7 von 5 Sternen vergeben. A journey through pain, confusion, regret, and ultimately healing of three damaged souls battling personal demons in search of closure and peace.There was hesitation teasing amid the opening pages, a vibe that hinted something was off. My curiosity grew immediately, so I continued reading. As I did, I discovered the story was written from three separate point-of-views, which I thoroughly enjoyed. It was done well both structurally and to move the story along.I was able to meet each main character more intimately. It gave the emotional challenges of young death, survivor's guilt, abortion, and betrayal a personal face for me to see as I read. Take Eli. His selfless attitude about his mentally challenged twelve-year-old brother was utterly refreshing. Despite the skeletons in his closet that he was dealing with, he made time for his brother and his mother. Then there was Jeremy. Seeing his world from his eyes drew me closer to him. And yes, conjured a few tears.But the tears really flowed for Hailey. Her shock and struggle of 'new' self acceptance was heartbreaking. I could see why she didn't feel worthy of forgiveness or why she didn't want to move forward. Jeremy's acceptance that he could never be with her again was just as tear-jerking, yet beautiful all the same.The writing flowed with an emotional edge that did the story justice. An elegance to the prose that added just the right amount of emotional elevation at the right time. By story's end, I truly felt like I knew each character. I love that.I truly hope you check out this book. I began reading it one day. A few days later, I picked it up again at bedtime, thinking I'd read a few chapters and then go to sleep. Nope. I read the last 3/4 of the book before I finally passed out at 3:30AM. It was one of those stories I just had to finish that night. Or in this case, morning. Young love storyI liked the book. It kept my attention and my emotions. You feel the same way the characters are feeling. Hailey and Jeremy were coming home from a party when Hailey was momentarily distracted while driving and they got into an accident. 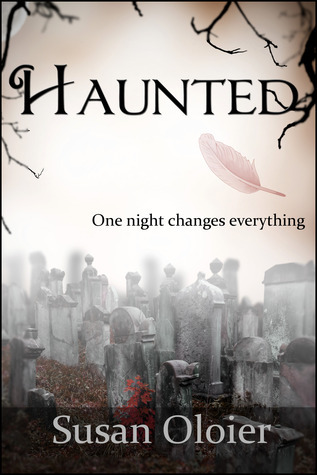 When Hailey goes to visit him in the cemetery, Jeremy does not realize that he is dead. When Hailey returns to work at the library, she runs into Eli who is playing his guitar for the children. He is dealing with some drama of his own after his break-up with longtime girlfriend, Madeline. Will Hailey and Eli be able to help each other recover? What will happen to Jeremy? This is a well written, quick read from characters alternating viewpoints. * I received a free copy of this book in a contest and this is my honest review. This book was easy to get into and was a great peek inside personal loss and trying overcome tragedy and move on to love and trust again. Susan Oloier - Susan Oloier is the author of My Life as a Misfit, Fractured, Superstitions, Outcast, Haunted, and the screenplay Simple Fugitives. She is co-author of the Horror Street Series. She has been a columnist and writer for both regional and national publications, including The Daily Beast. Susan currently lives with her husband and two sons. When she's not writing, she loves to read, rock climb, and ride her bike.